If you like having the defense spread out but want to keep one classic big man on the floor, whether it’s to protect the rim on defense or be a post threat the opponent needs to respect on offense, than a 4-out offense may be your best option. When you’ve got a great low post scorer, sometimes putting two bigs down on the block only ends up hurting them, making it easier for the defense to help or trap. Many successful pro and college teams instead choose to surround their post up center with four shooters spread out around the outside, forcing the defense to make a decision – allow the post player to go one on one or help off and risk giving up a wide open three point shot. When it comes to personnel, ideally you’d have four perimeter players, all capable of hitting the three point shot or handling the ball with confidence, as well as a post player who can both create a shot down low on the block as well as see the double team coming and find the open man. The post player will also need to be fairly comfortable on the outside, as quite a few of the plays will see an exchange between the power forward and the center at some point. With the emergence of more perimeter oriented forwards, were seeing more and more of these types of offenses and if you have the correct personnel, they can be extremely effective. 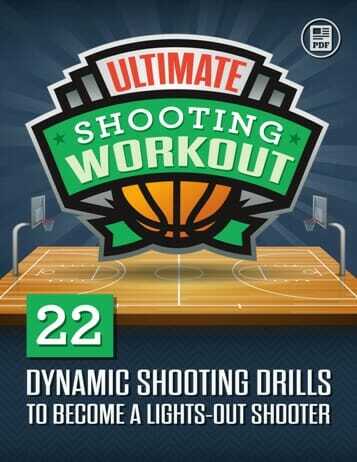 Discover 29 stunningly effective plays for spreading the defense, dominating the paint, and getting boatloads of wide open threes! 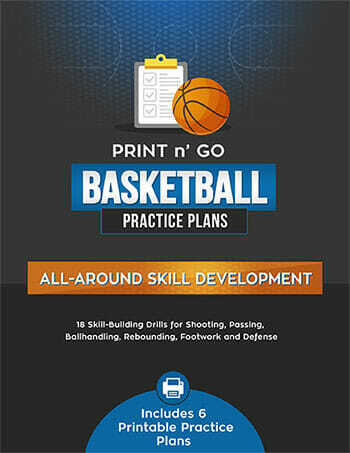 Instant PDF access to the complete playbook. Download to your computer, save to your mobile device or print a hard copy. 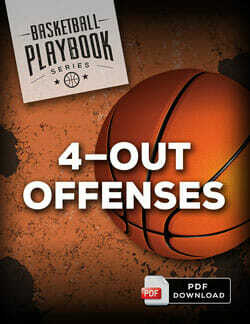 Download the 4 Out Offenses Playbook today! 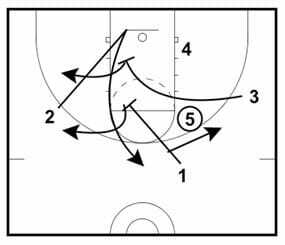 Below is a sample play from the 4 Out Playbook, created by the University of Wisconsin’s Bo Ryan. We’ll start this next play off in our normal 4-out alignment, with the point guard kicking the play off to the center flashing up to the right elbow. While this pass is being made, the two guard and power forward will cut into the paint, with the power forward coming all the way over to the right block and the two guard slowing down in the middle of the key. http://www.online-basketball-drills.com/ebasketballcoach.com/p/4out.htmlThe small forward and point guard will then set staggered screens for the two guard, who will cut up the left lane line and out to the top of the arc. The center will then look to hit the four man down low on the block if possible, with his second option being the two guard coming out up top. After setting their screens, the small forward and point guard will space out, heading to the left corner and the left wing, respectively. If the two guard wasn’t open for a catch and shoot, the center will then either pass directly to the point guard on the left wing, or hit the two guard to swing the pass right over. Once the point guard has received the ball, he has quite a few different options. 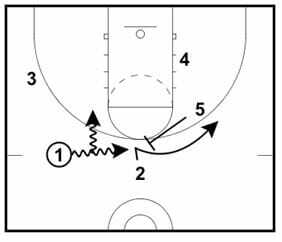 The center will come up and set a flare screen for the two guard, and the point guard will dribble hard right at this screen. From here he can either hit the two guard fading to the right wing, look to attack the hoop and create his own shot, hit the center slipping to the hoop, or use the center as a ball screen and see what his options are again from there. If you like that play and want to see more, make sure you download the complete 4 Out Offenses Playbook. 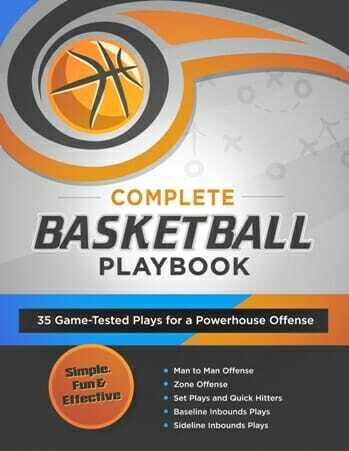 You’ll get 29 stunningly effective plays to help your team spread the defense, dominate the paint, and get boatloads of wide open threes. not for young ages where you should not use screens. No it is not too complicated!! I use the 41 in my 5th & 6th girls team. I have simplified some stuff but they really like it because they can score against almost all teams @ that level. This is their go to offense. I like the play except I am coaching freshman, is it too complicated?